31 December is called Hogmanay in Scotland. Perhaps because at one stage in its history, the celebration of Christmas was banned in Scotland, the Scots have always made New Year's Eve something special. The traditions associated with this pagan mid-winter festival are repeated not just in Edinburgh, the capital city, but in towns and villages throughout the country. You will find a selection of the events on 31 December 2000 described below, but most occur every year. Although attempts are being made to reduce numbers this year (the crush has been overwhelming in earlier years) the biggest Hogmanay party in Scotland is being organised for the centre of Edinburgh, around Princes Street, its gardens and with the backdrop of the floodlit Edinburgh Castle. The Hogmanay celebrations are the culmination of a month-long series of events in which half a million people will participate. 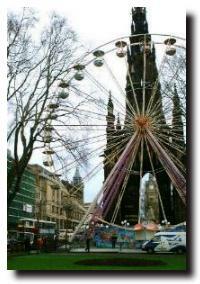 An ice rink in Princes Street Gardens operates over the whole festive season and a Ferris Wheel (pictured here) is in located beside the Scott Monument. The torchlight procession this year will march from the Edinburgh Castle down the Royal Mile to the Palace of Holyroodhouse. On Hogmanay itself, rock and pop bands will be performing on stages in Princes Street Gardens and the huge fireworks display will use not just the backdrop of the castle but other prominent hills in the city. The images will be broadcast on TV across Britain - and the world. As in Edinburgh, there is month-long entertainment leading up to 31 December. There is an ice-skating rink in George Square but unlike douce Edinburgh with its gentle Ferris Wheel, the entertainment in Glasgow is accompanied by the excited screams of children (and some adults!) 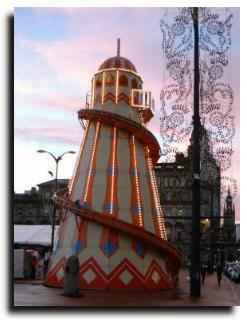 sliding down a "Helter Skelter" (see illustration). Over 100,000 revellers will join in the Glasgow Hogmanay Party in George Square and other city centre locations. In the late afternoon of 31 December, there will be a large fireworks display at the new Pacific Quay development using the 328 feet high Glasgow Tower and futuristic Glasgow Science as the backdrop. 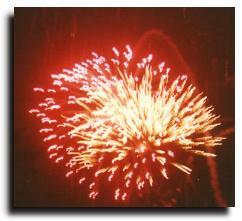 At midnight, around the City Chambers there will be another huge fireworks display. A re-enactment of an ancient Druid fire festival is being arranged for this south Lanark town, with a torchlight procession and huge bonfire (bigger than ever, say the organisers). The bonfire is a Biggar tradition to burn out the old year and burn in the new. During World War 2 a candle was lit in a tin can to keep the tradition alive. There were complaints in the 1990s about the noise and fire hazard and as a compromise, the fire brigade were engaged to put out the fire at 1.0am. Except that once the fire brigade were gone some of the locals poured gallons of diesel on the remains and got it going again! For pictures of the event, see Biggar Bonfire Web site. The City of Discovery is holding a series of family events including a carnival and a "Millennium Meltdown" on ice. The culmination of the day's celebrations is a spectacular fireworks display on top of the nearby Law Hill, a favourite beauty spot overlooking the city. On 1st January, the "Ne'er Day Dook" organised by "Ye Amphibious Ancients Bathing Association" takes place at neighbouring Broughty Ferry as swimmers dive into the river Tay - tide permitting. 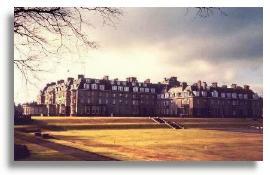 Five star Gleneagles Hotel in Perthshire has copious supplies of bottles of top quality champagne so that their guests can bring in Hogmanay in style. The Royal Burgh of Lanark is organising a torchlight procession through the streets to Castlebank Park culminating in a fireworks display and street party. 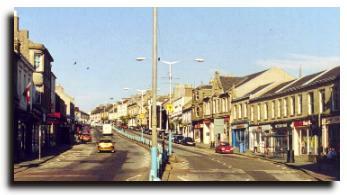 This small rural town in Renfrewshire is located beside the bird sanctuary in Clyde Muirshiel Regional Park. Perhaps out of consideration for their avian neighbours, there are no fireworks scheduled here. Instead there are environmental and cultural activities culminating in a 24-hour party to celebrate rural community life. There will be a torchlight procession, led by a pipe band, from St Catherine's Road to the North Inch (one of the city's parks beside the river Tay). The procession will include children dressed in costumes from around the world. There will rock and pop music on stage at the North Inch and a fireworks display immediately after the bells ring out at midnight. After the merry-making of Hogmanay, the last thing anyone would want to do is to go swimming in the icy waters of the River Forth. But that is exactly what the "Loony Dook" (silly swim) is all about. 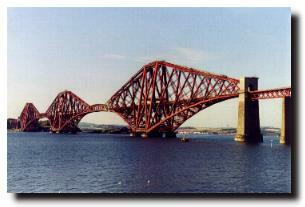 Overlooked by the famous Forth Railway Bridge, hundreds of participants will sober up rapidly. And it is all in a good cause - they collect money for charity. 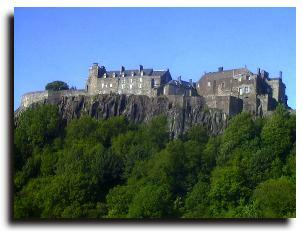 Last year, Stirling used its historic castle as the backdrop for its Millennium celebrations. In memory of a 9th century event when the town was saved from a raid by Norsemen, a 50 foot sculpture of a wolf was set on fire on Wolf's Craig, a rocky outcrop near Stirling Castle, after the bells brought in the New Year. This year there is to be a 15-minute countdown to midnight, accompanied by audio and lighting effects and culminating in a fireworks display. In the town itself, there is a "Hogmanay Party on Stirling Rocks" featuring rock and pop bands with a Scottish flavour such as Delgados, Wolfstone, Shooglenifty and Blazin' Fiddles.